Firstly an apology if you have been trying to contact us via the contact me form recently. It appears that this hasn’t been forwarding on messages to us. So if you sent a message recently and haven’t had a reply, we are not ignoring you! Please do send your message again as it should now be fixed. We aim to reply within about 48 hours unless I am on an epic journey! 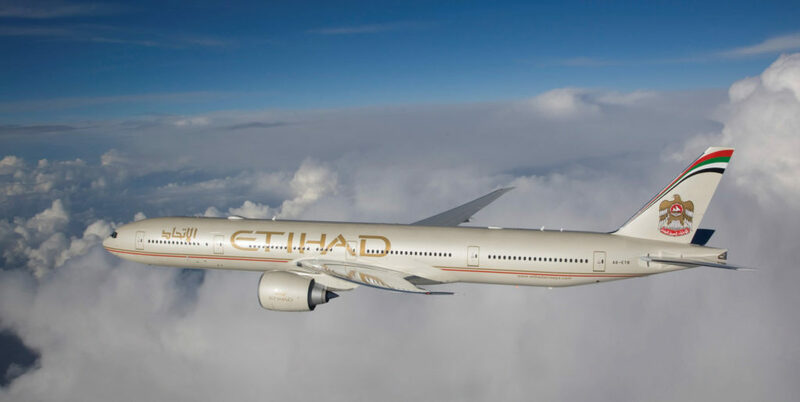 Cathay Pacific is a great airline in my experience but normally extremely expensive – as they say, you get what you pay for! Being part of oneworld it also allows you to collect Avios and tier points which is a bonus. 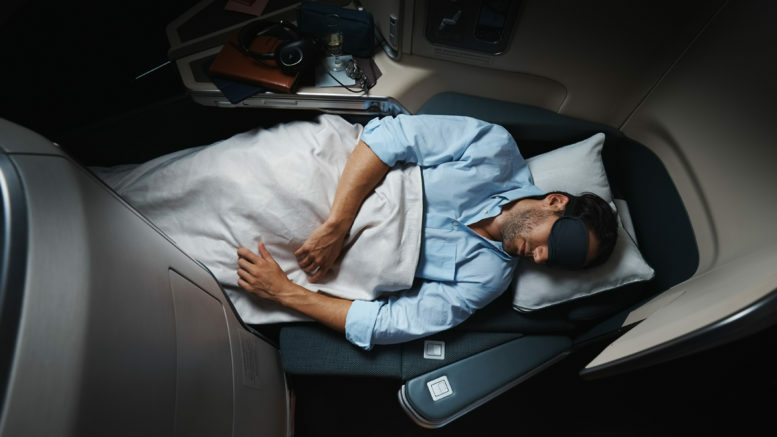 The latest Cathay Pacific sale has a few prices which whilst being in a different ballpark to the recent Qatar bargains, are actually pretty good for them and brings them into the same price range as a BA sale for the Far East. Cathay Pacific fly their B777-300ER from Heathrow and A350 from Gatwick to Hong Kong with the same reverse style herringbone seats as Qatar. Although most of the best fares are indirect flights to Asia via Hong Kong, this could be something of an advantage. This gives you a chance to sample some of Cathay’s fantastic lounges in Hong Kong including the newly opened The Deck. If they are still making Mojitos at the Long Bar at The Wing lounge, I recommend asking for one topped up with Champagne instead of soda water, something I discovered in Hong Kong at the rooftop Ritz Carlton bar. It’s not on the menu but they are happy to do it for you although you may start a trend as I did! Roving Reporter and I will be on a mission to sample as many First and Business Class lounges as we can on our visit to Hong Kong later this year to bring you full reviews. If you fly from Heathrow you can sample the great Cathay Pacific Business class lounge there or go on a lounge crawl of all the oneworld lounges in Terminal 3. The sale has a long travel period with travel available from 13 April 2018 to 30 April 2019. There are some blackout periods. You must book by the 15 May 2018. You can find more details on the Cathay Pacific website. If you are looking for a cheap price to Hong Kong itself, there are quite a few days this year with BA direct flights from £1796 which you can find using the BA low fare finder. Plaza Premium who run the worldwide lounge group including several at Heathrow will soon bring Aerotel, an international airport transit hotel brand, to the U.K. As part of the launch, Aerotel will be offering customers 30% off the cost of their booking on stays between 1 May 2018 and 1 July 2018. Aerotel London is due to open at Heathrow Terminal 3 in April 2018 and is now available for online reservations. 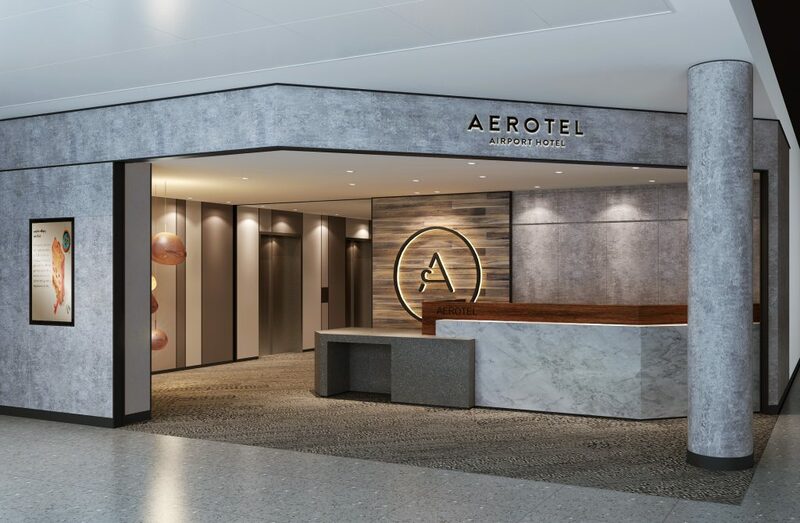 With existing hotels already in Singapore, Abu Dhabi, Rio de Janeiro, Kuala Lumpur and Muscat airports, Aerotel London will be the sixth hotel to open and the first in Europe. Aerotel will be the only airport landside hotel at Heathrow Airport Terminal 3. It is located in the east wing of Terminal 3 arrivals and will be open for arrivals 24/7. As there is currently no hotel linked to Terminals 2 or 3 this is a welcome addition. The only option if you don’t want to stay off airport is to stay at Terminal 4 or 5 and transfer on the Heathrow Express or tube. The Aerotel is only a short walk from Terminal 2 and the central bus and Heathrow Express stations. Although you don’t get all the facilities of a full-service hotel, I find these type of hotels very useful. I stayed at the Gatwick Bloc Hotel which is a similar concept. It was perfect for an early morning flight when you just want to get to the airport the night before and go straight to sleep. Being only a lift ride away from check in the next morning is a big advantage. No worrying about getting to the airport on the Hoppa bus or train. 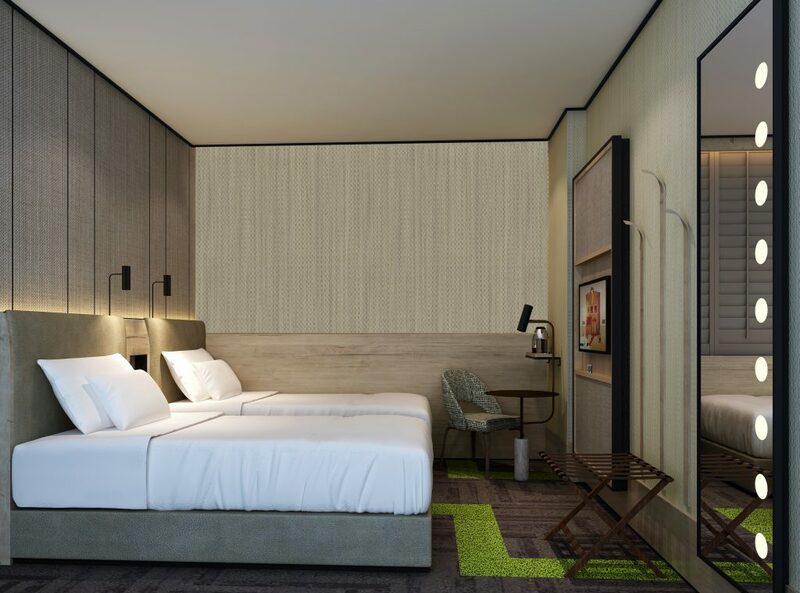 The hotel wants to aim more at the premium market offering handpicked mattresses and pillows to offer travellers quality sleep and power showers. There are four different types of rooms; Solo Plus, Double Plus, Double Squared and Family. Solo Plus bedrooms are suited for solo travellers who require a space to rest and relax. Double Plus comes equipped with two single beds or one double bed. Double Squared bedrooms are designed to accommodate up to four guests and Family bedrooms are equipped with two queen size beds for up to four guests. Aerotel London also features a 24-hour Library Lounge offering hot and cold food and drinks. The hotel sells rooms in a way so that you can use them for a long layover or an overnight stay. They provide flexible bookings which are available in hourly slots for a minimum of six hours. Rooms start from £50 for six hours (or from £35 including the 30% off special opening rate on stays between 1 May and 1 July 2018). You can find more information and book on www.myaerotel.com. UPDATE: Reader Ian has reported below that he has found rooms to be cheaper via booking.com which also offers Avios through the Avios store. The Aerotel page for booking.com is here. If you are planning to buy a flight and also need a hotel it may be worth a quick look at Expedia today as they have 20% off flight and hotel packages which ends today, 30 March. These deals can often work out the same or marginally more than buying the flight alone so are well worth a look. 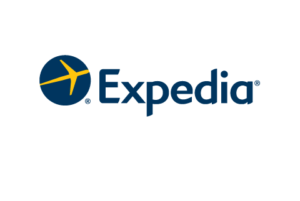 The Expedia sale page is here. 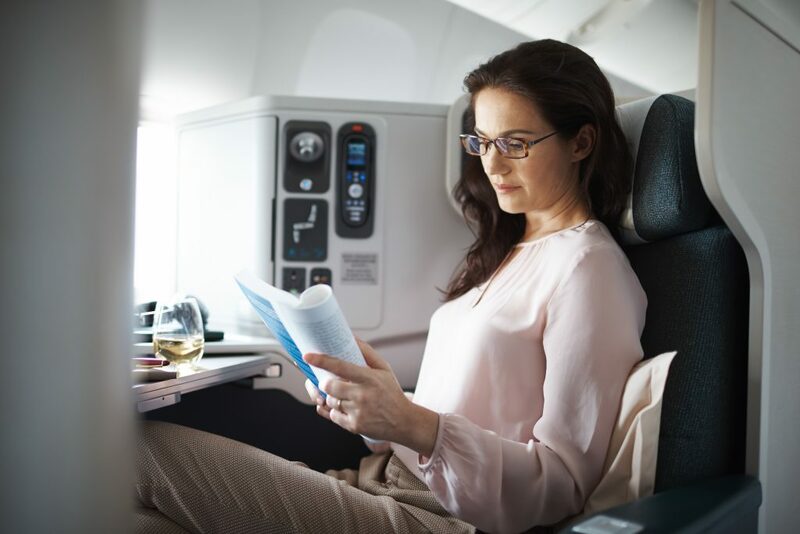 6 Comments on "News & offers: Cathay Pacific sale, new in-terminal hotel at Heathrow, Amex travel benefits"
Your readers may be interested to know that I booked Cathay a year in advance to visit family in Australia through Trailfinders last Christmas/New Year. All flights in business class, awesome top notch hotels for……. That’s an amazing price. Trailfinders offer some really good deals when you add on accommodation. Booking that far in advance for Christmas is also a wise decision if they are good deals around. Yes I did. I am having a think and will get back to you later! Thank you for the heads up on Aerotel Heathrow, very handy for those Helsinki flights with BA. Found their official site a bit cumbersome, poor and not user friendly. They have three rates, Day, sleepover and getaway and a lounge that is a bit misleading because it seems to give you nothing free other than a few free magazines. I found booking.com, with Avios attached, are selling their rooms a lot cheaper than their official site. The price for a double, 3pm onwards is anything from £101-144, but don’t know if the Terminal 3 location is still enough to drag me away from the Hilton at Terminal 4. Anyway I will still give it a try and see if this new arrival is worth a current high price tag for an exceptionally small room. Great tips Ian. Let us know how you get on when you stay. I plan to try it out too when I get the chance. I will update the post with the booking.com info. I know what you mean about being tempted away from some of the other hotels. I guess it depends how much a bit of extra sleep is worth versus the Hilton Points and facilities.